Shortly after it began trading, Innocent received a letter from the Trading Standards Office enquiring about the two ‘plump nuns’ listed among the ingredients of a smoothie. Innocent replied that it was an allusion to the purity of the contents. The TSO asserted that consumers would be confused and concluded that ‘you must either remove the reference to “plump nuns” on your label or start putting them in your fruit juice’. This is one of many wonderful stories in A Book About Innocent: Our Story and Some Things We’ve Learned (the title has echoes of Sagmeister’s Things I Have Learned in My Life So Far) written by two of its founders. Innocent is a phenomenon. Started by three friends in 1999, it has gone from zero to £100 million in ten years, and is now Britain’s largest smoothie-maker. This book is a hymn to its founders’ sophisticated naivety and refusal to take no for an answer. 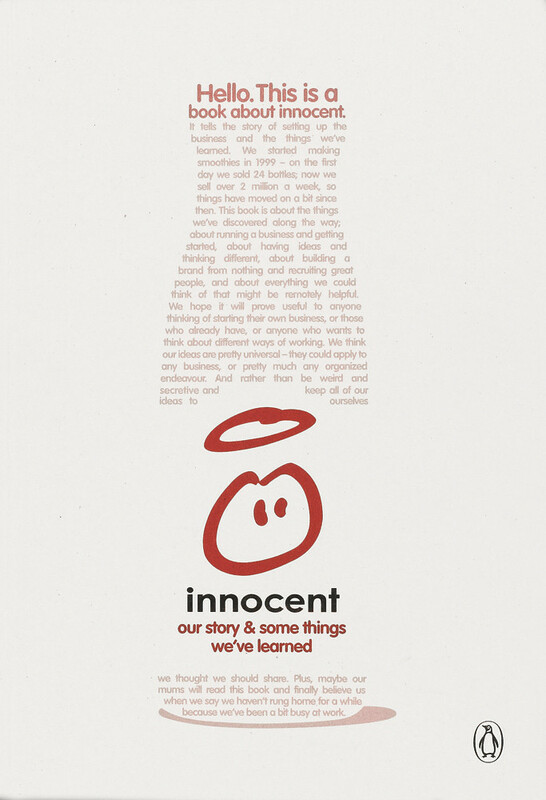 Innocent has grown way beyond a drink in a bottle to become a symbol of brand innovation that challenges the indifferent marketing, cloned language and unsustainable business practices of many industries. The Innocent tone of voice has become such an icon of effective communication that clients – from oil companies to estate agents – beg copywriters like me to dust them with a little ‘Innocent magic’. But Innocent’s roots are its reason for being. The company is driven by deeply held beliefs about business ethics, employees and suppliers, origin of ingredients, equitable interaction with the planet, and developing conversations with their ‘drinkers’. The story behind their identity harks back to the days when all it took to launch a household name was a bright idea and bags of enthusiasm, and a certain Mr Pemberton of Atlanta, Georgia sold the first bottle of Coca-Cola to his local soda fountain. Contemporary branding exercises run by multinational agencies go through hundreds of iterations over months of negotiations and the results are usually dismally generic. Innocent needed labels so they had a chat with a designer called Gravy at Deepend who scribbled the face and halo in three seconds. And although some people thought it represented a pig’s nose underneath a baguette, the sense of celestial wholesomeness was spot on. It is a compelling example of product, design, words and images forming such an intuitive identity that everyone in the company knows whether a decision, a strategy or a campaign feels ‘Innocent’ or not. Supermarkets and chiller cabinets are so overloaded with merchandise that mimicks Innocent, that the strength of the original is in danger of becoming diluted. And there are times when this book risks slipping into parody. A quirky personality that entertains us on the back of a bottle while munching a sandwich is a bit of a marathon over 185 pages. As the book develops, the business proposition – simple, healthy, delicious and sustainable – becomes encumbered with checklists, bullet points, useful hints, a ‘codified set of values’, golden rules, theories, principles and criteria. But these are niggles, and the substantial messages of how they made their dream happen are enhanced by delightful imagery – from thumbnail sketches imagining what Innocent could be, to glimpses of life in Fruit Towers. The book is very good on creative entrepreneurism – they really did throw out all the rules. When Innocent works best, they say, it is like ‘a giant amorphous blob with a permeable skin, with information flowing in and out by osmosis’. This first edition was completed in January, before Coca-Cola acquired a slice of the Innocent pie in April 2009. A second edition, printed in September, will bring the story up to date.